What Is The Definition Of Nock In Archery? 1. This is the end of the arrow which rests against the bowstring when a bow is drawn. A notch or groove is placed in the arrow’s back tip in order to stabilize the arrow on the string. Nocks were originally added to arrows by hand, but modern arrows are typically fitted with a pre-made nock that attaches to the arrow shaft. 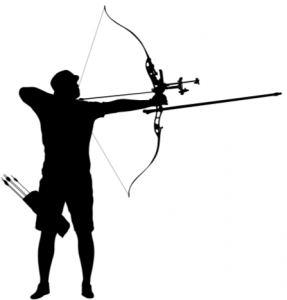 In addition, this term sometimes refers to the actual act of setting the arrow on the bow. 1. The archer nocks the arrow into place and prepare to take aim.